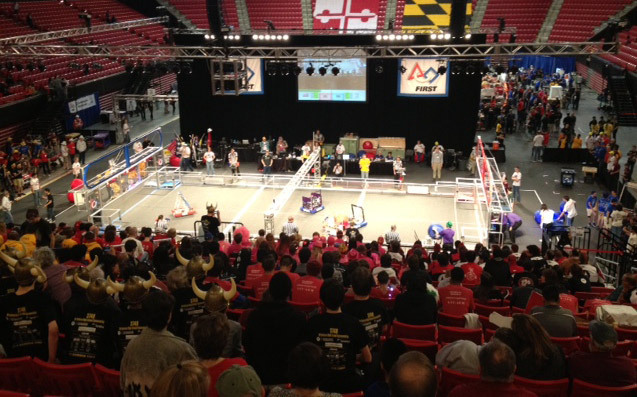 The University of Maryland hosted the Chesapeake Regional FIRST Robotics Competition April 3-5, 2014, on its College Park campus. More than 2,000 high school students, their mentors and teachers, family, and fans flocked to the university’s Comcast Center to check out the action. Teams of students from seven states, the District of Columbia, and Ontario, Canada, spent six weeks preparing for this season’s competition game, AERIAL ASSIST™. With guidance from technical mentors, the teams designed, built, and programmed robots to play the 3-on-3 game of passing balls to teammates and scoring goals. Of the six teams that advanced to the championship round, three were from Maryland. The highest honor of the event, the Chairman’s Award, is presented to the team that “embodies the goals and purpose of FIRST and best represents a model for other teams to emulate.” The award was earned by Team 1629, Garrett Coalition, comprised of students from Northern and Southern Garrett High Schools in Garrett County, Md. Regional winners included a three-team alliance consisting of the aforementioned Team 1629 Garrett Coalition, Team 2363, Triple Helix from Menchville High School in Newport News, Va., and Team 623, Cougar Robotics from Oakton High School in Oakton, Va.
Darryll Pines, Clark School of Engineering Dean and Farvardin Professor, helped to kick off the event by welcoming the competition to the University of Maryland for its first time, and announcing new scholarships for FIRST Robotics students who choose to attend the Clark School. U.S. Sen. Ben Cardin, U.S. Rep. Donna Edwards, and NASA Associate Administrator and astronaut John Grunsfeld came to College Park to support the event. Almost 200 volunteers and judges from well-known corporations including Booz Allen Hamilton, Lockheed Martin, NASA, and Northrop Grumman supported the event. Winners from the Chesapeake Regional FIRST Robotics Competition will go on to compete in the FIRST Championships in St. Louis, Mo., April 25-27, 2014. Get the full results from the competition. Learn more about FIRST Robotics.